G-NetLook Pro is an Android app for mobile network optimization. It can be used for visualization of mobile network, G-NetTrack Pro logfiles postprocessing, neighbor cells planning and antenna tilt adjustment. - Thematic map drop down menu - when logfile is loaded, the thematic maps can be changed via this menu. You have to wait till the thematic map is redrawn. - selected cell information - shows information about currently selected cell. Cell can be selected in two ways - from map (when click on cellname or middle of cell line) or when search for cell through Cell Search control. LOG tab shows information about currently selected measurement point. - serving bearing - the absolute value of the angle between serving cell azimuth and line between serving cell and measurement point - usually this angle is 0-90 degrees. Bigger values usually indicate swapped feeders on a site. Here chart representation of different measurement entities are visible. In this tab the height profile between serving cell and measurement point is visible. In this tab the measurement statistics presented as histogram charts are visible. - Log Reduction Factor m- USe this to reduce the number of measurement points. If it is set to 10, every 10th measurement point will be loaded. Check or uncheck different technologies and layers cells to show or hide them on the map. - Include missing neighbors in export - check it if you want missing neighbors to be exported in text and kml export files. - Use custom online data URL - check it if you want to use external database for log data and site data. If it is not checked then G-NetReport online database will be used. - Online site data URL - input the URL of php script for site data reading from external database. - Auto refresh time interval - interval for auto refresh when online log data is loaded. - Keep the api in background - check this to allow app to work in background. Also check in your phone settings that it is allowed for the app to work in background. - Keep screen on - keeps the screen on while the app is working. Changes the tabs. Tabs can be changed also by sliding. When online log data is opened it reloads the online data. The button is visible only when online data is loaded. When online log data is opened it activates/deactivates auto refresh of the online data. The button is visible only when online data is loaded. Set the auto refresh interval in Settings - Online Data. Loads the selected logfile. There is a sample logfile in folder G-NetLook/celldata. Several logfiles can be added if they are opened one after another. Loads site data from G-NetReport online database. This is an experimental feature. Loads the measurements from G-NetReport online database. You can use G-NetReport to send automatically measurement data to database. where SW and NE are South - West corner and North - East corner. 2. Go to Menu - Load Floorplan. The floorplans will be shown on map and for each floorplan a kml file will be created to be used with Google Earth. Notice that you have to change the image location tag <href> if you copy kml file and intend to use it on your computer. Here you can download floorplan sample. Export the visible cells in map view and neighbor relations as a kml file, which can be opened in Google Earth. Here is a sample kml export and here is a video demo. Adjust the tilts for all cells in visible area of the map. You can view recommended tilt for each cell in Cell tab when you select a cell. Opens G-NetLook Web app page. AZIMUTH - azimuth of the antenna - number. If you put 360, the cell will be shown as circle. If you want to change the size of the circle put values > 360. Then the circle radius will be value-360. - INFO - Whatever is written there will be displayed in NEI tab when the cell is serving cell. Use semicolon ";" for new row. Here is a sample cellfile. CLF cellfile is a format used with some network monitoring tools. It is a semicolon (;) delimited text file. The cellfile should be named cellfile.clf or [MCC][MNC].clf like 28401.clf. If you want to use clf format for cellfile make sure that there is no cellfile.txt in the cellfile folder, cause then it will be used as cellfile. The current supported format is clf 3.3.0. MCCMNC Network code MCC and MNC 5 or 6 digits decimal. Field is used for query. CID Cell ID 5 decimal digits with leading zeros for GSM, CDMA and UMTS. For LTE the ECI (E-UTRAN Cell ID) is used in decimal. Field is used for query. LAC Location Area Code decimal 5 digits with leading zeros. TAC for LTE, but is not used for query, but for 2G and 3G. LAT Latitude coordinate in decimal WGS 84. Use point as decimal delimiter! LON Longitude coordinate in decimal WGS 84. Use point as decimal delimiter! POS-RAT Accuracy of the site coordinates. Use -1 for the exact position. AZI Azimuth of the cell in degrees. Only integer values are used. HEIGHT Antenna height above ground level of the cell in metres. BW Beamwidth of the antenna. 0-360: beamwidth in degrees. Only integer values are used. 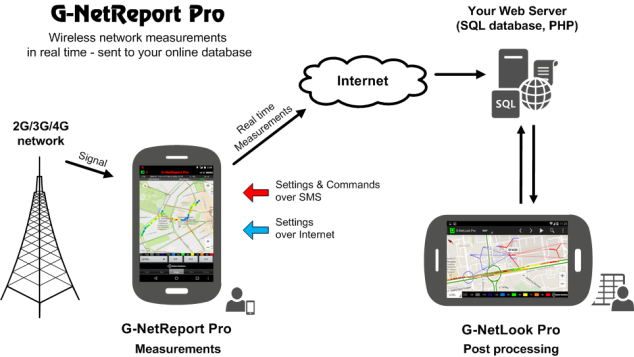 You can use your own database using G-NetReport Pro for Android for measurments or public G-NetReport database. - for measurements use G-NetReport Pro. Read in app instruction how to create your measurements database. - for reading logdata from database the script logdata.php is used. Copy it to your server and change connection parameters (server, database, user, password). Put the URL of the script in Settings - Online Data - Online Log Data URL. Make sure Settings - Online Data - Use custom online data URL is checked. - for cell data use create_celltable.txt script to create table called 'cells' in your database. - for reading celldata from database the script sitedata.php is used. Copy it to your server and change connection parameters (server, database, user, password). Put the URL of the script in Settings - Online Data - Online Site Data URL. Make sure Settings - Online Data - Use custom online data URL is checked.